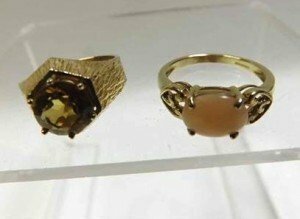 A 9 carat gold ring set with an orange stone to an octagonal carved setting stamped, together with a late 20th Century hallmarked 9 carat Gold Ring set with a pink Quartz stone and pierced heart-shaped shoulders. Two hallmarked 9 carat white Gold dress rings, each set with orange stone and a further unmarked yellow metal Dress Ring featuring a centre blue stone surrounded by small white stones. 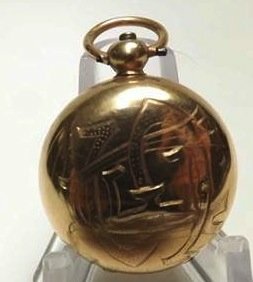 A late Victorian hallmarked 9 carat Gold Sovereign case with elaborate monogram to the front, sprung action, ringlet top. 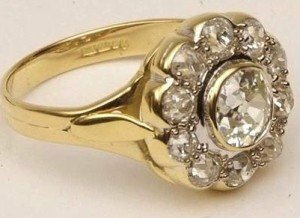 A hallmarked 18 carat Gold all Diamond Set Cluster Ring of flower head design, the centre stone 6 carat surrounded by ten smaller Diamonds. 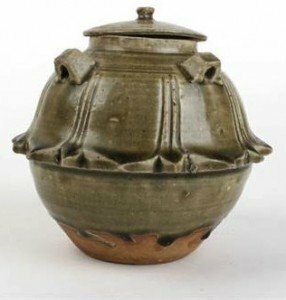 A Chinese Song Dynasty stoneware jar and cover in the form of a lotus flower decorated in a plain celadon type crackle glaze. 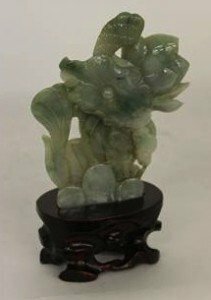 A modern Chinese jade carving depicting a fish amongst a water lily and other plants on a carved mahogany stand. 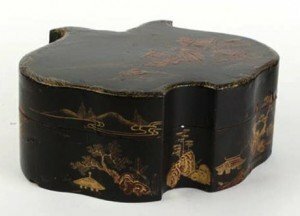 A late 19th/early 20th century Japanese papier mache box of irregular form containing two layers of eight shaped boxes. 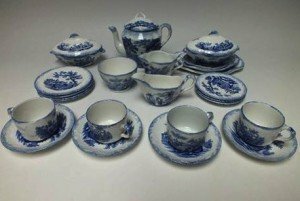 A Ridgeways antique children’s tea set in blue and white, decorated with scenes from Charles Dickens. comprising tea pot, milk jug, sugar bowl, four cups & saucers, four small plates, four larger plates, two tureens, one sauce boat and three graduated shaped platters. 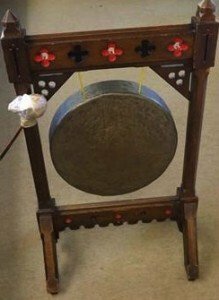 A late 19th Century Oak Framed Floor standing Brass Gong, the frame decorated with quatrefoil detail and raised on four short legs. 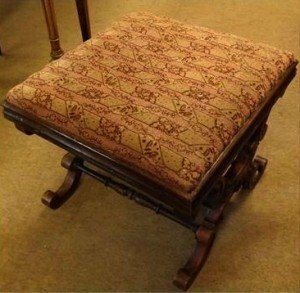 A 19th Century Rosewood X-frame Footstool, decorated with carved “C” scroll detail, joined by ring–turned stretchers and with upholstered seat. 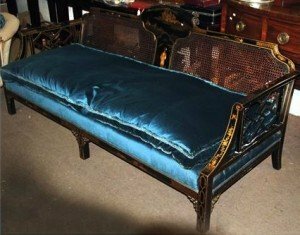 A late 19th Century Ornate Chinoiserie Black Lacquered Bergère Sofa, the frame decorated throughout with Oriental scenes, birds and geometric detail, cane back and plain apron, raised on plain square supports and the two arms with geometric splat supports. 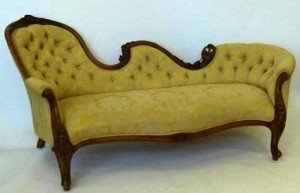 Victorian carved walnut show frame chaise lounge upholstered in yellow damask on French cabriole legs. 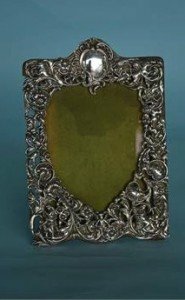 A rectangular silver picture frame with heart shaped centre, scroll decorated flowers and figures with vacant cartouche. 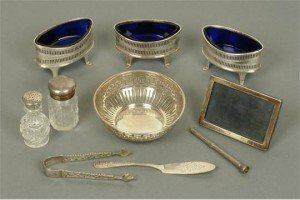 A silver bonbon dish, a small silver mounted photograph frame, a silver butter knife, three silver plated navette-shaped pedestal salts, pair of silver sugar tongs, silver mounted cut glass salt bottle, silver propelling pencil and a silver mounted cut glass pepperette. 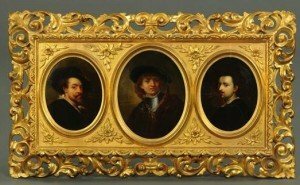 A tryptic of three portraits, each with an oval oil painting portrait after Reubens, Rembrandt and Van Dyke. All housed within an ornate giltwood and gesso Florentine frame. 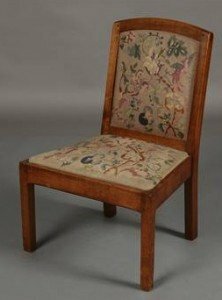 A light oak nursing chair, with plain arched back and frame woolwork floral back and drop in seat, on square section supports. 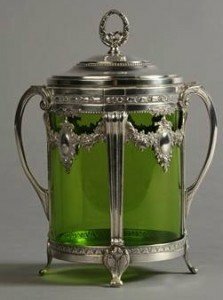 A WMF silver and green glass biscuit barrel, domed cover with laurel wreath finial, the open frame with swagged floral garlands each centred with a cartouche, bifurcated handles and on four feet. 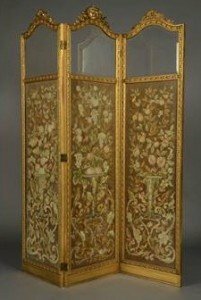 An early 20th century gilt wood three fold draught screen, of arched rectangular outline, each fold having a shell and foliate scroll pediment above a glazed panel with fabric panel below, embroidered with an urn of pomegranates, pears, apples and scrolling leafage, within a ovolu moulded frame. 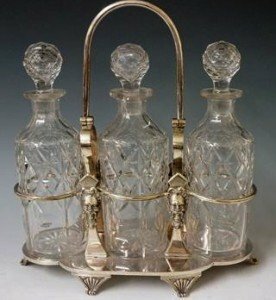 An Edwardian three bottle cruet frame with swing handle, the frame cast with bearded masks, the shaped oval base with six fluted and reeded scrolling feet. 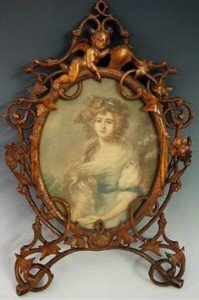 A finely carved pierced oval frame with cherub top holding a vacant cartouche the scrolling frame with leaves, flower heads and leafage the base with a carved armorial, with coloured mezzotint after Gainsborough.